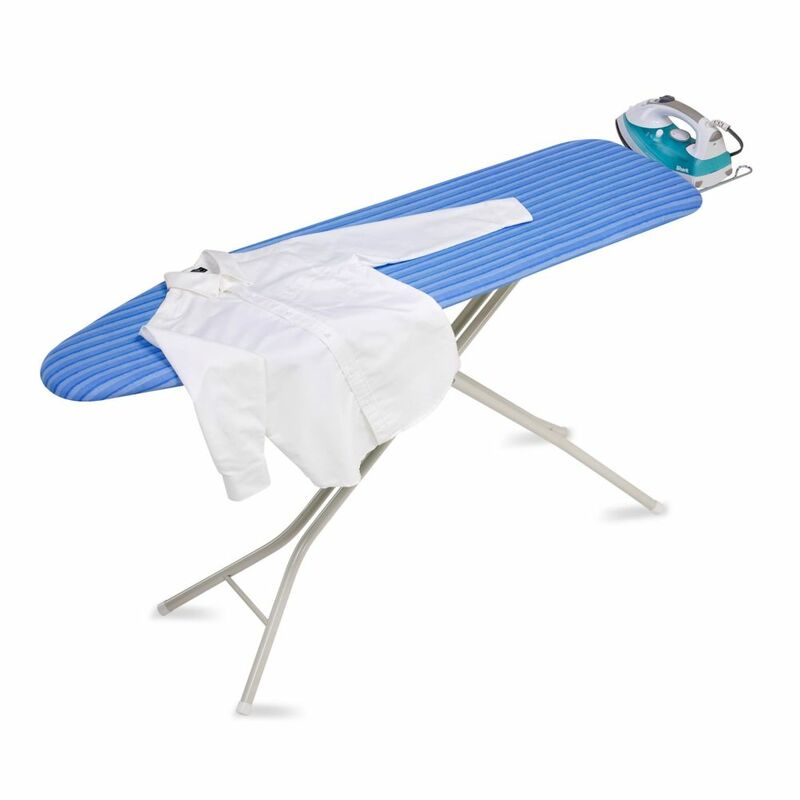 Honey-Can-Do BRD-01956 Quad-Leg with Retractable Iron Rest Ironing Board, White / Blue Cover. Classic styling and modern conveniences combine in this sturdy quad-leg ironing board. An integrated, retractable iron rest is the perfect spot to rest a warm iron and prevent scorching. The white, powder-coated steel frame offers 7-levels of adjustable height and incorporates a safety lock device. It's rust-resistant and folds flat when not in use for easy storage. A 100% cotton cover in a blue striped pattern includes a 4mm thick foam pad for a smooth ironing surface every time. This contemporary laundry sorter is not only attractive but durable, too - features a steel frame in a rich espresso brown with 3 machine washable hamper bags. Keep laundry neatly organized and contained with three hamper bags to sort lights, darks and colours. Each hamper bag is easily removable and replaceable on the frame. Includes easy-glide casters. No assembly required. 2-Bag Mesh Rolling Hamper, White / Blue. An economical laundry solution, this rolling hamper has two compartments to make sorting laundry a breeze. Sturdy, washable mesh bags let clothing breathe and helps keep mildew at bay. Bags are removable and feature a drawstring closure that prevents spilling and doubles as a carrying strap making them quick and easy to transport. Smooth rolling casters on a PVC frame make this sorter light and easy to maneuver. Whether you're going all the way to the laundromat or just down the hall, this mesh laundry sorter will get you there in comfort and style. Colour: White / BlueSome assembly required With stringent quality control methods, Honey-Can-Do confidently offers a limited lifetime warranty on every product they make. 4-Leg Ironing Board with Retractable Iron Rest Honey-Can-Do BRD-01956 Quad-Leg with Retractable Iron Rest Ironing Board, White / Blue Cover. Classic styling and modern conveniences combine in this sturdy quad-leg ironing board. An integrated, retractable iron rest is the perfect spot to rest a warm iron and prevent scorching. The white, powder-coated steel frame offers 7-levels of adjustable height and incorporates a safety lock device. It's rust-resistant and folds flat when not in use for easy storage. A 100% cotton cover in a blue striped pattern includes a 4mm thick foam pad for a smooth ironing surface every time. 4-Leg Ironing Board with Retractable Iron Rest is rated 2.5 out of 5 by 2. Rated 4 out of 5 by Grandma from Met expectations. Easy to purchase on line. Excellent delivery in timely manner. Quality of ironing board met expectations. Rated 1 out of 5 by jknapp from Piece of junk ironing board This is a very flimsy ironing board that will not adjust in height and will not lowere the ironing board from the highest point. I thought paying nearly $60 would result in a sturdy, well-built product, but this is not the case. Do not order this item. I am surprised Home Depot has such trash on their website. Makes all other products found there suspect.